Recently, we posted a guide on How to update AT&T LG G2 D800 to Lollipop by manually installing the official FOTA update. In case you’ve updated your LG G2 to Android 5.0 Lollipop and want to root it then you’re at the right place. One can easily root almost all variants of LG G2 running Lollipop OS in 1-click with ‘LG One Click Root‘ tool. Besides G2, this tool supports several other LG phones like G3 (all variants), G3 Beat, G2 Mini, G Pro 2, etc. The tool comes in two versions, one is GUI based while older one works via script method. By rooting G2, you will be able to install power apps that require root, install custom ROM/ kernel and moreover uninstall all the bloatware that comes pre-installed on carrier variants. In case you want to root LG G2, then carefully follow the steps below. The process is pretty easy and shouldn’t take much time. 1. Download and install ‘LG United Mobile Drivers’ on your Windows system. 2. Download ‘LG One Click Root’ file and extract it. Then install it. 3. 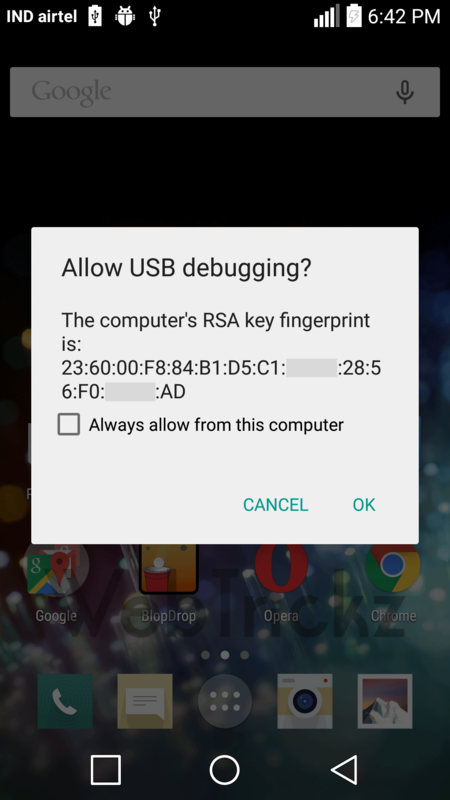 ‘Enable USB Debugging‘ on your phone. To do so, go to Settings > General > About phone > Software information, tap Build number seven times and then go to Settings > Developer options and turn on USB debugging. 5. Run LG One Click Root tool and select ‘Start‘. When it says ‘Waiting for device…’, get back to phone home screen and select OK for ‘Allow USB debugging?’ prompt as shown. The phone will reboot at 45% and after rebooting when it says ‘Looking for LG serial port’, go to home screen again and select OK to Allow USB debugging. 6. The device will now reboot into ‘Download mode‘ (Firmware Update). NOTE: For some reason, the tool got stuck at 90% on computer (0% on firmware update screen on phone) and this happened couple of times. To get through this problem, just restart the phone by long pressing power key while it’s connected to the computer and process is stuck at 90%. It should then show 100% and Done! After reboot, look for the SuperSU app which should get installed on your phone. If you don’t see SuperSU installed, then just do the whole one-click procedure again starting from step #5 and it should work. 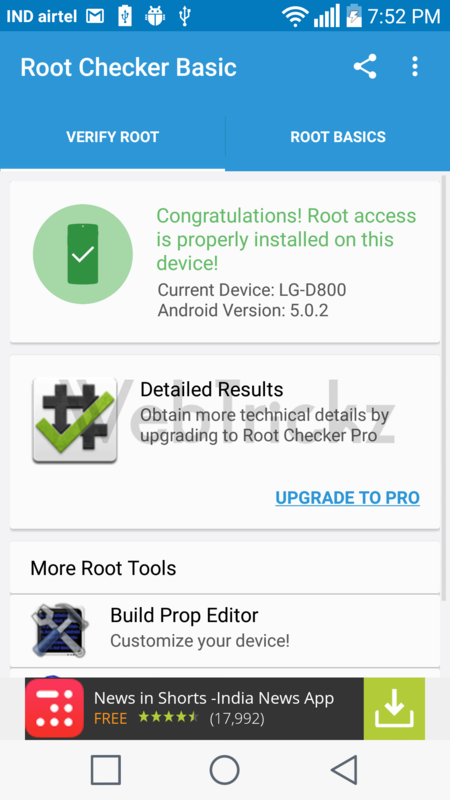 You can install the ‘Root Checker’ app to confirm root. Did you tried the same procedure again? Check the note above. Reboot the device manually while it’s connected and it’ll show 100%. If it doesn’t shows SuperSU installed after reboot then repeat the procedure again. It worked! First two times failed… third times the charm. I wonder what caused it to fail the first two times? Thanks for the article! Very easy to do, took less than 10 minutes. If you are stuck at 90%, you can try the script method and make sure run cmd in Administrator, and cd to your folder. That work for me. I can confirm this works flawlessly and easily on G Flex 2 (H959). THANKS! at fourth time it was done! Works fine in att lg g2. Now, how do I remove bloatware? Worked perfectly on my T-mobile G2(D801) running 5.0.2. Thank you very much! MTP not worked for me. i selected PTP option. If Serial port not found! insert the phone manually into Download mode. Then press and hold the Volume Up button, and while you\’re doing that connect the USB cable again. Serial port not found! please insert the phone manually into Download mode. Tried your move; got an error prompt on my laptop at 90% saying The program can\’t start because MSVCR100.dll is missing from your computer. Try reinstalling the program to fix this problem; then finishes at 100% done but my phone got stuck at download mode; any ideas? If the Root works properly, Is it supposed to wipe everything and have a fresh install? I keep re-rooting and nothing seems to work. ive tried 4 times and it stops at 90. i reboot it manually as said but supersu doesnt get installed. pls help. Mine is also stuck at 75%. Checked devices and there is a exclamation point next to the MTP USB Device. (also yellow exclamation points next to CDC serial & LGE Android phone). I think that is the issue. I have tried updating the drivers and it hasn\’t fixed anything. Hi, i had problem with getting stuck on 90 % many times too. I uninstall my old driver and install driver ver. 3.14.1 (from this site) and than it works at the first time (with long pressing power key for reboot). However i can´t know, if driver is the reason ;). stuck at 75% on computer and 0% on phone, it says it cant find the serial port and says to manually enter download mode, so i did that but the app never reactivates to start the process again, just stuck on the firmware update screen. is there any technique to root without pc. Worked first try (G2 d801 T-Mobile). Just waited while it did it\’s thing (seemed to take longer than i thought it would, just be patient). Thanks Mayur. Having problems. Keep on getting \”The program can\’t start because MSVCR100.dll is missing from your computer. Try reinstalling the program to fix this problem.\” error prompt on my laptop and the phone does not go to DOWNLOAD MODE. Please help what to do. Badly need it. Thanks. tried the gui 4 times with no luck, then tried the scipt (plus i waited for about 10 minutes while phone was in download mode) and it worked!! oh yeah mine is d800 at&t. Worked like a charm on my LG G2 D802. 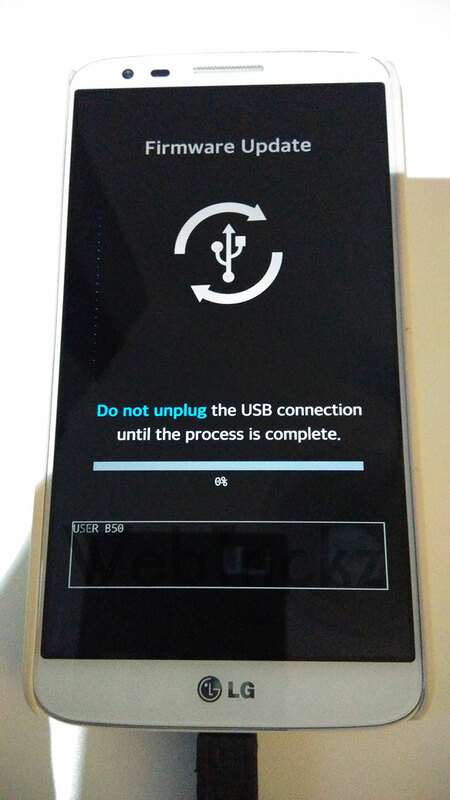 Did restart the phone when process got stuck at 90% then it\’s done!. Thank you. Many thanks. Worked the first time I tried. Mine\’s LG has been stuck on that firmware screen for a while. I\’ve tried holding down the re-start button, but have had no joy. I\’ve noticed some commenters above mentioning their phones being plugged into a computer. How/hwy would a phone be plugged into a computer? Is this something which I need to do to get rid of this firmware glitch? I tried this process almost 12 times and every time its stuck at 90%. can any body will help me for? I went through with the whole process flawlessly. It even reached 100% and rebooted for both the computer and phone. That\’s great. But now the phone will not boot. it is stuck at the LG logo and the notification lights keeps blinking green. Please help me!!! Is it too early to start panicking?? Does it need your computer or phone connected to the internet while performing the rooting? or you just need internet when downloading the files? Thanks for your tip. Mine kept getting stuck at 90% and then after I followed your advice which was holding down the power button while still connected to the computer the phone restarted and process was complete same as your screenshot. Any idea to resolve this problem ? Works for me every time, but after last reboot SuperSu doesn\’t appear on my phone. genial funciono en un lg g2 vs980 en el quinto intento!!! I got it to work, basically the first time failed, the I hit Cancel and reboot by G2 then the second time it works. Thanks. My phone battery would not wall charge normally after any rooting. I first rooted my LG G2 D800 with KitKat, then I recently restored and upgraded to Lollipop then rooted. The charge would get stuck at 65% or 73% so I replaced my two year old battery, no change. I kept on having to unplug my cable then plug it back in and it charged very slow. It would also connect and disconnect the charging repeatedly. It drove me crazy! After some research I realized that not all wall chargers are the same. My LG came with a 1.9A charger. Most cheapo chargers are 1.0A. I purchased a 2.1A charger (higher charge rate used for iPads/iPods) As soon as I started using that 2.1 Amp USB wall charger my charging was back to normal. I hope this information helps those who have the same problem. On my LG G2 D800 my install got stuck at the 90%. Rebooting and repeating did not work for me. Through trial and error I found two ways to get the install to 100%. The first time I got it to root successfully I simply pushed my Volume Up button and it went to 100% install immediately. The second time I rooted the Volume Up (repeat) or Volume Down (repeat) buttons did not work so I just pushed my Power button, did not hold it in, and after several times (repeat) it finally went to 100% install. Each time I was patient and waited a few minutes at 90% before doing what I did to get the install to work 100%. it doesn\’t work with samsung cable, when I though that I must use ORIGINAL LG cable at first time all gone ok ! Hi guys, I have solved the problem for those stuck at 90%. I think it has to do with the USB you\’re plugged into. I was using a USB3 port and it would never get past 90%. As soon as I switched to USB 2 port, it worked immediately. It took me about an hour to realise this. Phone is rooted!! This does *NOT* work for a T-Mobile LG G2 D801 running Lollipop. \”Looking for LG serial port\” times out with a registry error. This happens under both Windows 7 and Windows 10. Thanks alot my Hero 😀 .. it\’s working on my Lg g2 (D802) perfectly! PERFECTO … MABUHAY … EXCELLENT … it works like charm on my LG G2 F320S korean version … thank you so much. Thanks! Worked in my G2 [d802/v30b] at the first time! Not working for my lg g2 sprint please help. I have tried over an over still nothing it says its rooted but i dont have su. LG G2 D802. Worked the third time. yeah it wrkd well…..jus reboot ur fone wen stuck at 90% on d comp an 0% on d fon by long prsin d powr button whil it is connected 2 ur comp….den it shws 100% done. It did not reboot into Download mode. It rebooted into \”normal\” mode and I\’m stuck at 45%, \”Waiting for device\”. I tried a couple of different methods. shutting down and restarting, holding down the up key and power key or just the power key. It will then go to 75% and stay there \”Waiting for Device\”.